Reinauer Transportation Companies, LLC, purchased two GE U.S. Environmental Protection Agency (EPA) Tier 4 certified marine diesel engines and two Lufkin Marine Propulsion Gearboxes for its new articulated tug and barge (ATB), GE Marine announced. The ATB will be built by Senesco Marine and is scheduled to be commissioned in early 2016 to transport petroleum products in U.S. and International coastal waters. Local engine support will be provided by GE Marine’s Distributor, Cummins MidSouth. “We are delighted that Reinauer chose our new EPA Tier 4 certified diesel engines and look forward to delivering it next year. Our engines require no Selective Catalytic Reduction (SCR) after-treatment or urea injection, which saves customers significant space, weight and infrastructure costs,” said Afra Gerstenfeld, General Manager of GE Marine. “We also take great pride in Reinauer’s continued confidence in our American Bureau of Shipping (ABS) rated gearboxes for dependability in heavy-duty workboat applications such as ATBs.” said Darin Swartz, Product Management Director for Lufkin. A study conducted by Jensen Maritime, a naval engineering and architectural firm, was commissioned by GE to compare its U.S. EPA Tier 4 and IMO Tier III compliant in-engine, urea-free solution to other solutions on the market that use urea based aftertreatment. It concluded that, for operation on a typical line-haul tug, GE’s solution reduces approximately 75% of the engine room space required by the other market solutions; and reduces weight by approximately 75% versus the other market solutions; and • Does not require additional onboard equipment/storage for urea or dockside support infrastructure for urea storage and processing. 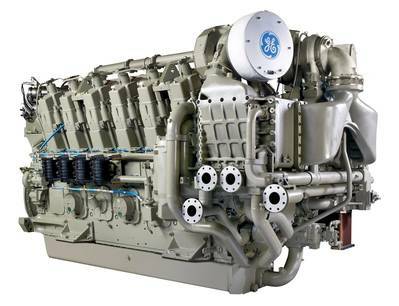 GE Marine was recently granted U.S. EPA Tier 4 certification for its 12-cylinder V250 marine diesel engine. GE Marine is working to achieve U.S. EPA Tier 4 and IMO Tier III certification for its entire family of V250 and L250 marine diesel engine models that also utilize non-SCR technology to reduce key emissions by an estimated 70%, without the use of urea based after-treatment.